Huge Savings! 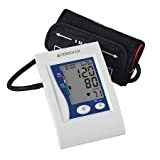 Up to 12% off on Blood Pressure Monitors at Muscle Pain Relief Rubs. Top brands include Nokia health, GE, Veridian Healthcare, Omron, Microlife, CMI Health, Unknown, ADC, BND-Welch-Allyn, BND, & DIRECT INC. Hurry! Limited time offers. Offers valid only while supplies last.